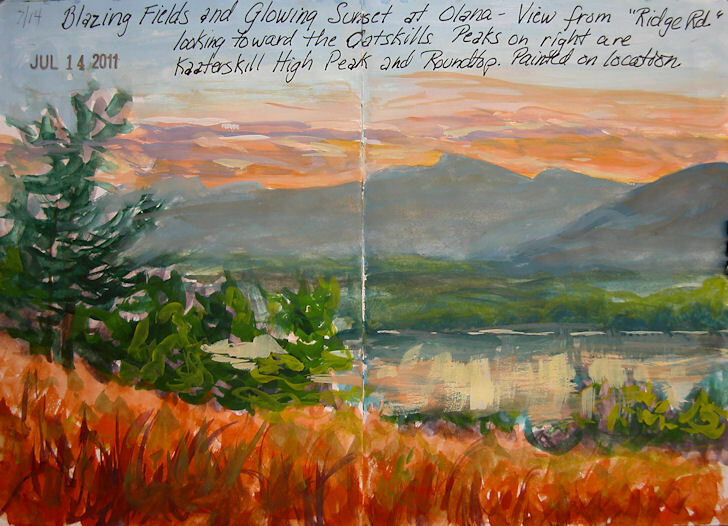 I spent a couple of days painting at Olana, mostly from this old carriage road called "Ridge Road". 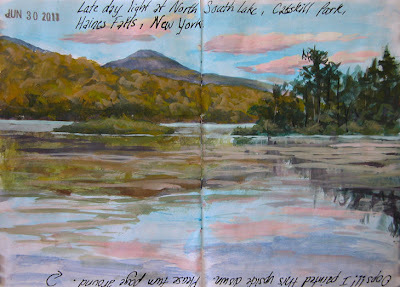 In Frederic Church's time, it was one of the main roads on the property, and he did many paintings from this location. Some sections are very overgrown, and we no longer have all of the magnificent Hudson River vistas from Church's days, but some areas have been cleared to let us see how it used to be. 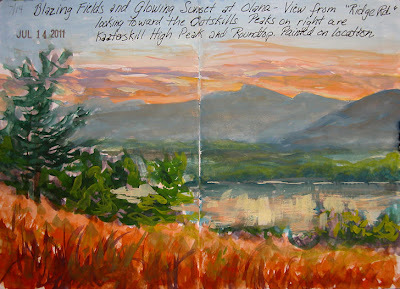 This is one of those cleared areas overlooking the Hudson, with the Catskill skyline and glorious colors in the sunset. Frederic Church did a famous painting very close to this spot, but that view is now closed off by foliage. 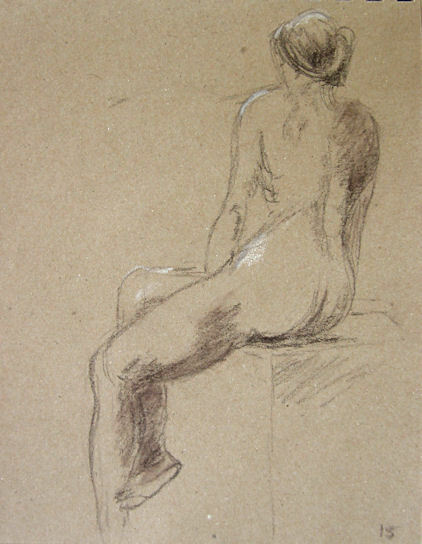 Today I went to open studio figure drawing for the first time in over a year! Every year, I attend regularly during the winter months when it's freezing cold out and I don't enjoy plein air painting. There's nothing like drawing from a model to sharpen drawing skills. But this past winter there just didn't seem to be a session around that fit conveniently with my schedule. The one I went to this morning was in Hudson, at the Opera House. I don't think I'll be able to do this on a regular basis there, but it sure was fun to be back in the figure studio again. Poses ranged from 1 to 25 minutes. This one was a 15 minute pose. 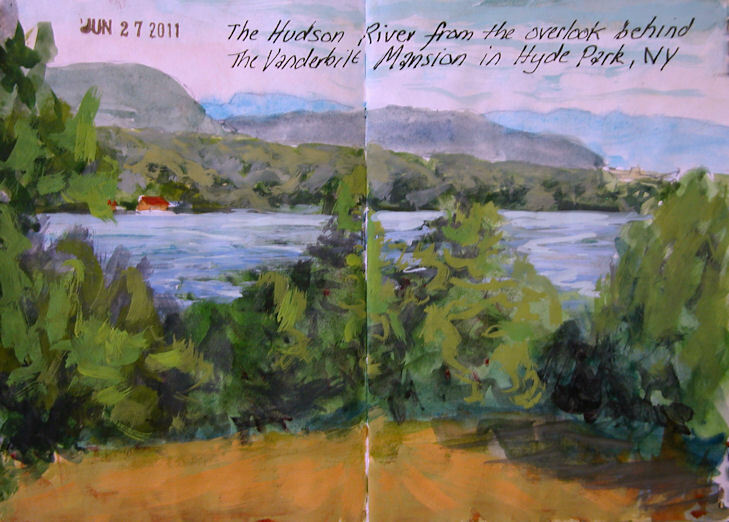 No sketchbook of the Hudson Valley would be complete without including the amazing overview from Boscobel Restoration in Garrison, New York. 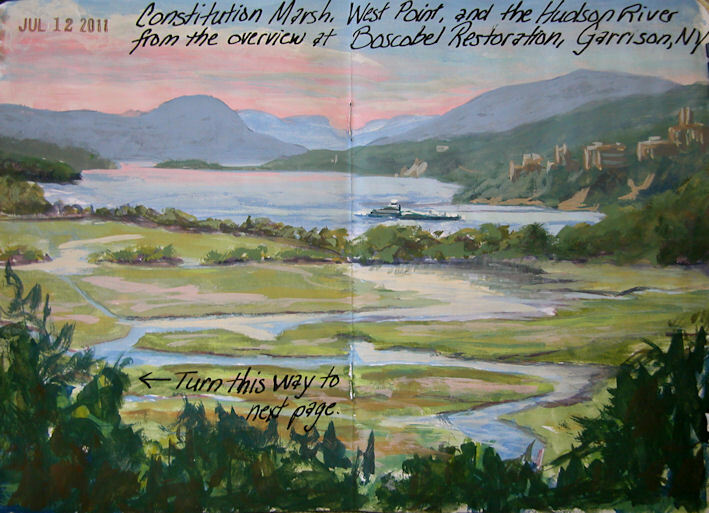 The vista showcases the Hudson River as it winds through the mountains of the Hudson Highlands, with Constitution Marsh in the foreground, and the massive buildings of West Point Military Academy along the opposite shore. A nice tugboat and barge even came by just as I was finishing up, so I was able to include some river traffic in the sketch. Like last time, I got so involved in composing the scene and painting that I forgot to orient the sketchbook before I started. I ended up with another upside down sketch! I think my viewers will be dizzy by the time they arrive at the back cover of my sketchbook! I can't believe I made such a dumb mistake, but I painted this upside down into my sketchbook for The Sketchbook Project 2012. So when my sketchbook goes off on its world tour, you'll all be able to arrive at this page of an upside down painting! I thought it best to at least post it right side up, so I'll save you the trouble of turning your computers over to view it the way it is in the book! This was painted in gouache at the NYS DEC Campground at North South Lake, in Haines Falls, NY. The land shapes are broad and simple, which contrast with the complexity of the water movement, reflections, changing values, and pond scum in the water. Overall it's a very challenging scene that I have revisited many times. The Hudson River from Plum Point through the Hudson Highlands. Painted on a moody day for The Sketchbook Project 2012. 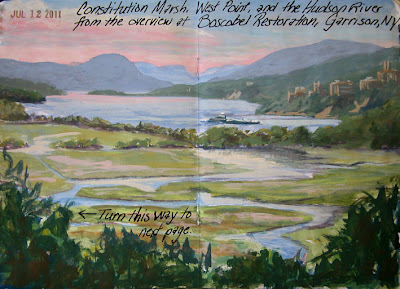 To see my oil painting from here, visit my website, Hudson Valley Painter. 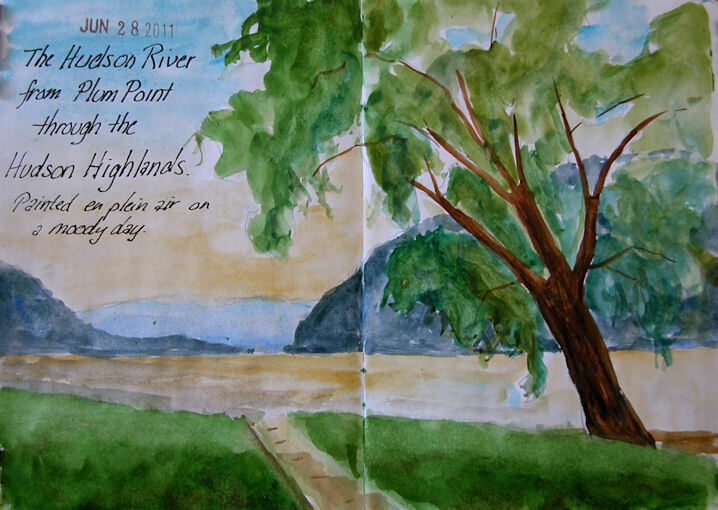 This sketch was painted on location behind the Vanderbilt Mansion in Hyde Park, New York. It is watercolor and gouache, done in the sketchbook provided for The Sketchbook Project 2012, so it will be part of my book that will go on tour and reside in the Brooklyn Art Library. The Vanderbilt Mansion sits high above the shoreline, overlooking the Hudson River, and is a favorite painting location for many artists in the Hudson Valley. After doing this sketch, I went down to the riverfront to do an oil painting. You can see that painting here.